Conflict In Gaza: Here's What You Need To Know Today : The Two-Way Despite a demand from the United Nations Security Council for an immediate and unconditional cease-fire, fighting continued in Gaza, where the death toll has surpassed 1,000. 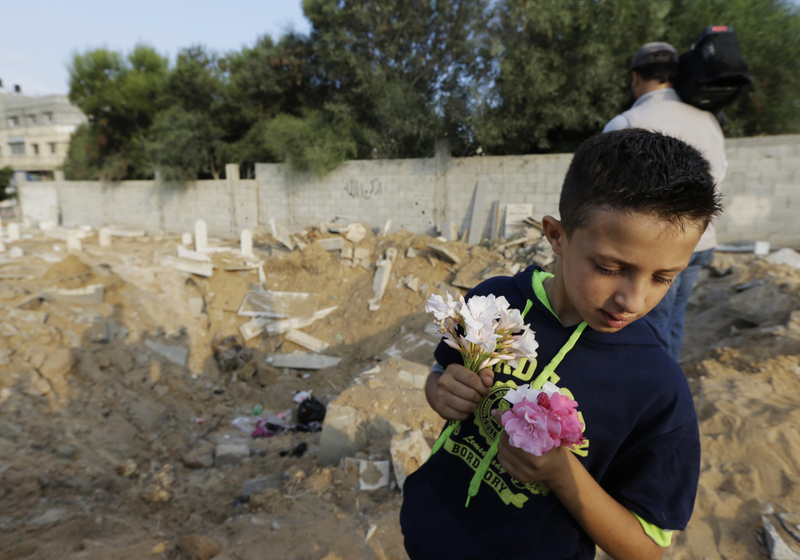 Palestinian Saeb Afana, 12, stands on the edge of a large crater from an Israeli missile strike that destroyed several graves, as he carries flowers at a cemetery in Gaza City on Monday. Despite that call, fighting continued. The Associated Press reports that Israeli jets continued their offensive in Gaza, and Hamas militants continued to launch rockets into Israel. Explosions hit a hospital clinic in the Gaza Strip as well as a nearby playground; Hamas and Israel each blamed the other. The death toll has reached more than 1,000 in Gaza; 40 Israeli soldiers have been killed along with three civilians. The AP and Reuters are reporting that there were explosions reported near the grounds of Gaza's Shifa hospital and a nearby park. "The Gaza park attack happened as children played on a swing in the Shati refugee camp on the edge of Gaza City, said Ayman Sahabani, head of the emergency room at nearby Shifa Hospital. Sahabani said nine of the 10 killed at the park were children under the age of 12 and 46 were wounded. "The strike on the park occurred a few minutes after the hospital's outpatient clinic was hit, leaving several people wounded. Camera crews were prevented from filming the area of impact at Shifa." Palestinian and Israeli officials both blamed the other side for the strike. In a statement, a spokesman for the Israel Defense Forces said it was misfired Hamas rockets that struck the hospital. "At the time of the incident there was no Israeli military activity in the area surrounding the hospital whatsoever," the IDF said in the statement. President Obama called Israeli Prime Minister Benjamin Netanyahu. "The President made clear the strategic imperative of instituting an immediate, unconditional humanitarian ceasefire that ends hostilities now and leads to a permanent cessation of hostilities based on the November 2012 ceasefire agreement," the White House said in a readout of the conversation. "Michael Oren, the former Israeli ambassador to the U.S., criticized the US administration on Israeli Army Radio, saying that it treated Hamas as a legitimate organization. "Oren says Israel doesn't need international backing. 'It has to be made unequivocally clear that it is in our interest to restore security to Israel's citizens by all possible means. And even if we have to stand alone sometimes, we are a very strong people. There is a national consensus; we can take it.'" On Morning Edition, Soraya reports that recent polls show about 80 percent of Jewish Israelis support the military operation.